Walk into Lake Park on a Sunday morning and it’s pretty clear, we like kids here! 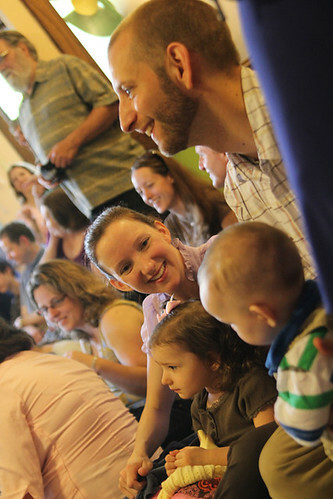 Church is a place of connection for kids as well as adults. It is a gift to see children building relationships with God, their peers and families and church friends too! We celebrate this on Sundays and with activities throughout the year. Join us for engaging children’s sermons during worship, an active Sunday School with teams of teachers at each grade level, fun activities for the whole family! If you would like more information about any of the programs listed, please contact us and a Children’s Ministry volunteer will contact you with more details. On Sunday mornings, we have opportunities for faith formation for children of all ages in between worship services! Children ages 3 and under are invited to our Stepping Stones Sunday School! Stepping Stones children will engage in circle time, hear a story, and have free play. Children in K4-5th grade are invited to Godly Play, which is a Montessori-based Sunday School curriculum. Youth in grades 6-8 are invited to Middle School Faith Formation. Programming kicks off on Sep. 9th. Please click here to view and contribute to our wish list! or you can also login through your CCB account and search under “forms” on the left! We are always welcoming new friends, and will happily schedule an orientation for new students (or students whose parents think that it might be helpful to have a refresher!) throughout the year. Our Vacation Bible Camp, “Cross Training,” had its inaugural summer in 2016 and has been going strong since! Twenty-five kids (ages 4-14) from LPLC and St. Mark’s Episcopal Church met for four fun-filled, activity-packed half days. The goal each year is to have an interfaith, intergenerational and ecological-minded FUN experience! From visiting the Jewish and Muslim campus ministries, to spending a day in Alice’s Garden and at Luther Manor, we focus on accomplishing these goals as the kids enjoy their time together! Open each Sunday during the Sunday School year, the Children’s Library is a great place for kids of all ages (and their parents) to check out books about faith. Books can be looked at in the library or checked out for short periods of time. Every summer we encourage Lake Park kids and youth to attend Lutherdale Camp near Elkhorn, WI, for a week of play, prayer, and games as they get to meet counselors, have campfires, and enjoy a big worship on the final day. Confirmation at Lake Park is a two year program meeting every few weeks and regularly on Sunday mornings at 9AM. We learn about the bible, Lutheran traditions, sacraments, other faiths, write our own faith statements, and join in partnership with other churches. We go on winter retreats, perform service projects, and attend summer camps. The high school group at Lake Park meets every few weeks and Sunday mornings at 9AM for friendship, mutual ministry, and service. We go on winter and summer retreats and are part of service projects. We meet for mutual support and lead ministries in the church. You’ll see us in music leadership, traveling to El Salvador, or caring for kids in the nursery.